Online testing and targeting company Monetate today released its latest quarterly report on the state of e-commerce in the United States, dubbed EQ3 2012. 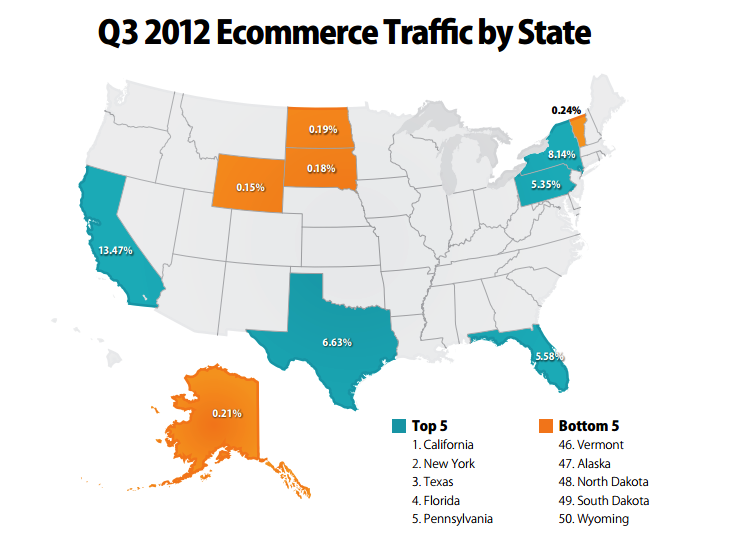 None of the top five states that drive the most traffic to leading ecommerce websites have the highest conversion rates. 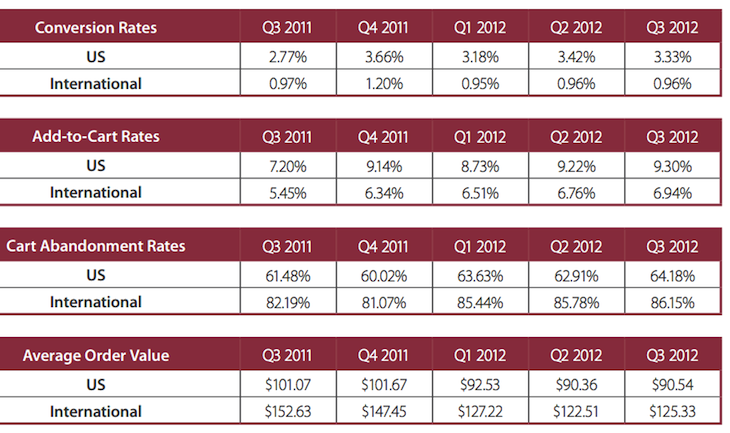 Traffic from Wyoming, which is responsible for the least amount of traffic (0.15%), converts the highest (5.02%). 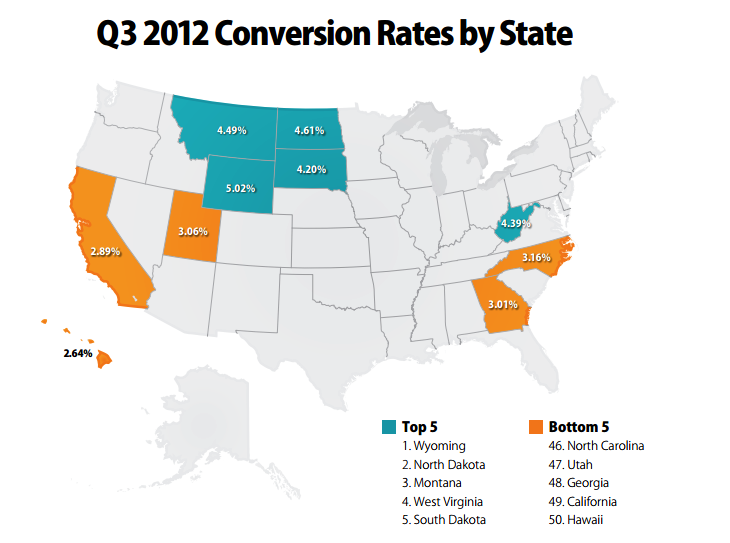 Equally interesting is California, which drives the most amount of traffic (13.47%), but converts at only 2.89%. Moving on to mobile traffic, Monetate notes in its latest EQ that total shopping sessions in one year from tablets has increased a whopping 161%, while traffic from smartphones has increased an equally impressive 119%. There’s no correlation between the states with the overall highest market share of ecommerce website traffic and the burgeoning number of visitors using tablets and smartphones. California, which overall drives the most ecommerce website traffic, ranks close to the bottom of tablet traffic market share (7.84%), while tablet users from Iowa are responsible for the least amount of website traffic (7.18%). According to Monetate, leading e-commerce websites receive the most amount of tablet traffic from shoppers in Hawaii (11.56%). 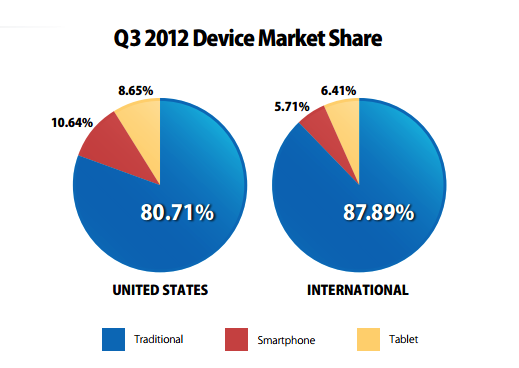 When looking at smartphones traffic, a significant increase in both Android smartphone shipments and the release of Apple’s iPhone 5 led to these devices surging past tablets in overall website traffic by almost 2 percent, while also reaching double-digit market share for the first time. Traffic varies state by state. 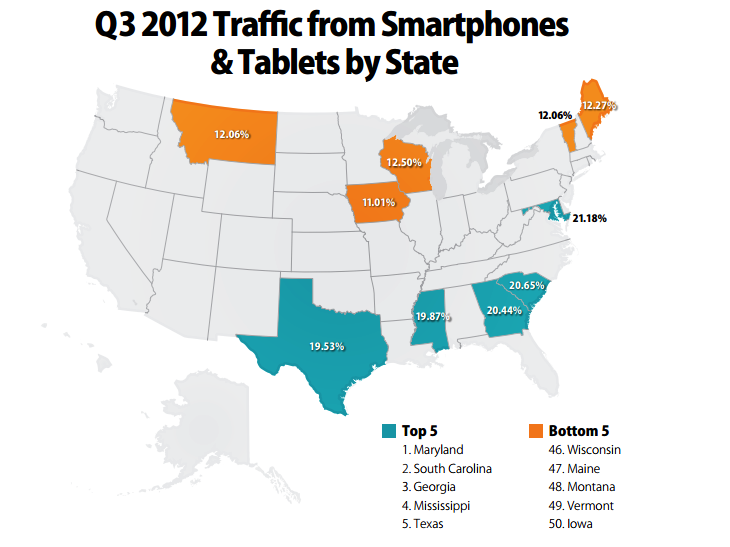 Maryland leads the way in driving the most ecommerce website traffic from smartphones with 12.40%, while five other states have more than 10% of smartphone traffic market share, namely Georgia, Mississippi, South Carolina, Illinois and Ohio. 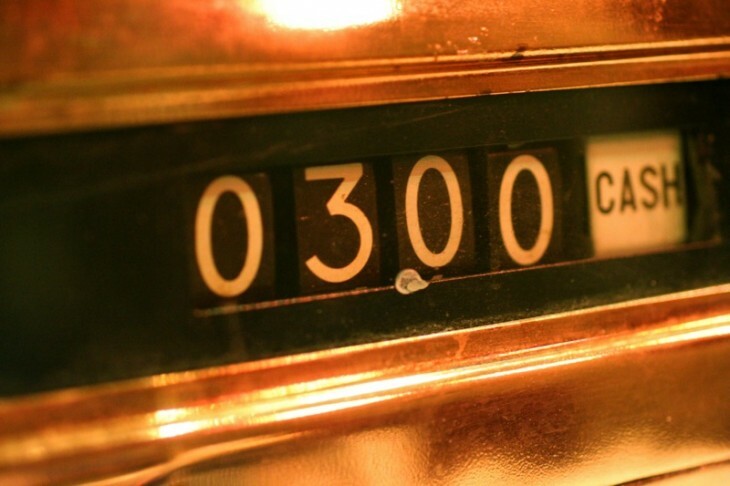 Based on average order value, international customers are said to spend 38.43% more than shoppers from the USA, but key performance metrics such as add-to-cart and conversion rates are significantly lower. 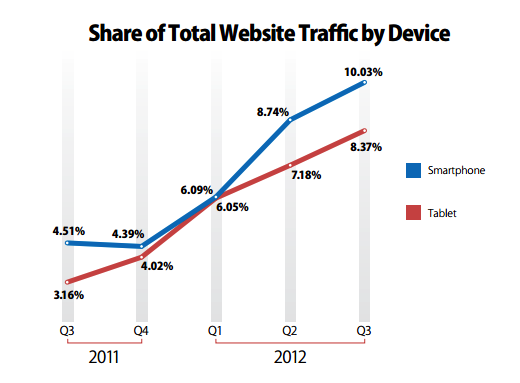 While smartphone usage across the globe continues to grow, Monetate says, e-commerce website traffic from smartphones and tablets lags behind the United States by more than 7%, with traditional desktop and laptop computers responsible for 87.89% of all international website traffic.